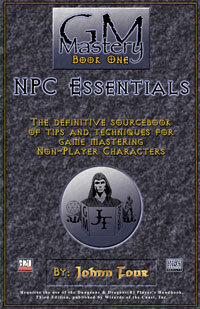 NPC Essentials is a collection of tips, techniques, and aids designed to help game masters inject detailed NPCs into any role-playing campaign. Inside readers will find advice on designing, role-playing, and managing NPCs during the entire lifetime of their campaigns. Also included are NPC archtypes, encounters, charts, and an example NPC centric adventure. Written by Johnn Four of RolePlayingTips.com and Dragon magazine fame and illustrated by V Shane. GM Mastery: NPC Essentials back in print!